Irma is projected to be completely gone from Florida by Tuesday morning. Irma weakened to a tropical storm Monday after hammering much of Florida with roof-ripping winds and gushing floodwaters that left more than half the battered state without power. The sun slowly began to emerge in parts of South Florida, but Irma was far from finished. Storm surge remained a concern across the region. In northern Florida, Jacksonville was among cities dealing with unprecedented flooding. "Seeing people playing in water. Please don't," Jacksonville Mayor Lenny Curry tweeted. "More flooding coming." Downed trees and other storm debris blocked roads across the state. The State Emergency Response Team said 58% of electric customers in the state — about 5.8 million accounts — were dark. Every county from Key West to the Georgia line was affected. Utilities warned that it could take weeks to fully restore electricity to the state's 21 million people. And more than 100,000 customers in Georgia also were without power Monday. The storm, centered more than 100 miles north of Tampa at 8 a.m. ET Monday, had maximum sustained winds of 70 mph, the National Hurricane Center said. Irma smashed into Florida on Sunday as a Category 4 hurricane with roaring, sustained winds of 130 mph. 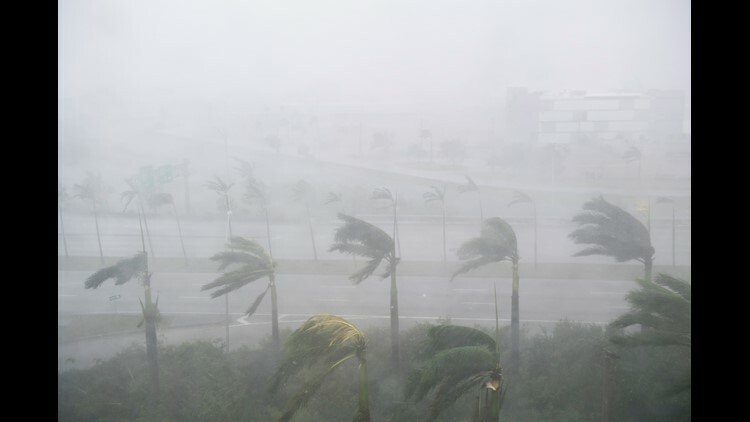 It ripped through the Florida Keys, then made made a second landfall Sunday afternoon on Marco Island, near Naples on the Gulf Coast. The storm roared north, wide enough to lash both coasts with wind, rain and ominous floodwaters. The Tampa-St. Petersburg metro area had braced for a direct hit that never quite came. Tampa Mayor Bob Buckhorn, saying the local storm surge apparently will not be as bad as feared, lifted the city curfew. "We really dodged a bullet," Buckhorn said. In Naples, crews saw no major structural damage and only minimal flooding in their initial post-storm tours, Mayor Bill Barnett said. In the Florida Keys, two airports appeared ready Monday to accept planes stocked with relief supplies for the stricken islands. Florida Division of Emergency Management Director Bryan Koon said Monroe County officials have not yet been able to travel the length of the island chain to assess the storm's toll. County crews spent Sunday clearing the airport on Boca Chica Key, and a team hoped to have another airport in Marathon ready to accept large military planes ferrying relief supplies, Koon said. The center of Irma will continue to move over the western Florida peninsula and then into the southeastern United States late Monday and Tuesday. Additional weakening is forecast. Storm surge will be a concern. 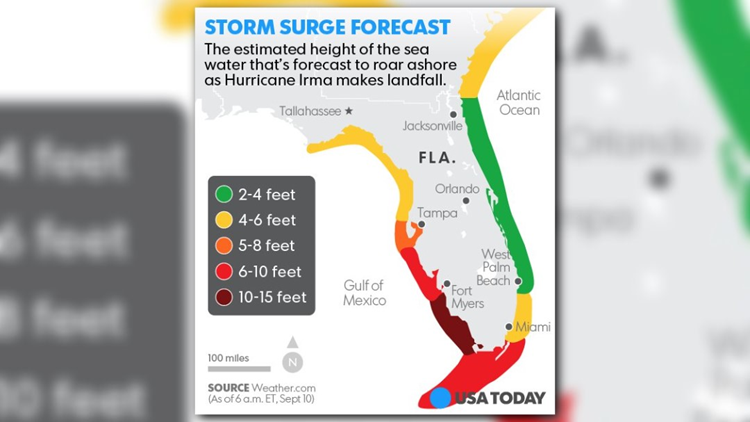 Florida's east coast is expected to get 3 to 5 feet of surge brought onshore by Irma's winds. Areas in the lower Keys got 10 feet and Naples has seen several feet, but an exact number hasn't been reported yet, National Hurricane Center acting Director Ed Rappaport said. Irma is projected to be completely gone from Florida by Tuesday morning. 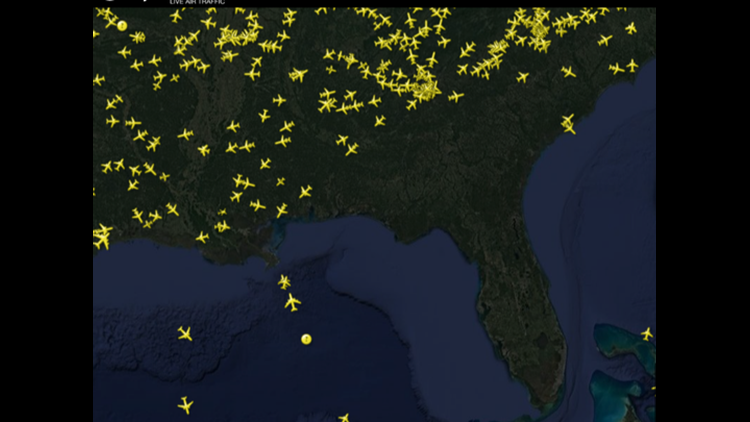 FlightRadar24 tracking maps late Sunday revealed that there was not a single flight in the sky over the Sunshine State, which usually boasts a bustling airspace befitting a tourism mecca. It was a far cry from the pre-Irma exodus that occurred in the days leading up to the monster storm's arrival in Florida, on the heels of a brutal march through the Caribbean that left at least 20 dead and some islands virtually uninhabitable. Concern that the storm’s powerful winds could weaken the dyke around Lake Okeechobee led Gov. Rick Scott to evacuate nearby communities. A test of the dyke by the U.S. Army Corps of Engineers showed no apparent damage. The Corps will perform another test Monday before they deem the structure safe, Koon said. Traffic patterns on U.S. 1 estimated about 10,000 people remained on the Florida Keys despite the mandatory evacuation. The storm made landfall Sunday at 9:10 a.m. at Cudjoe Key, between Marathon and Key West. Koon said first reports from the Keys showed U.S. 1 may be passable. None of the network of bridges linking the islands appears to be damaged, but they will require safety tests by the Florida Department of Transportation. The agency will fly a drone aircraft along the 100-mile stretch of road Monday morning. Meanwhile, county crews will continue to clear debris from the roadway, and work to shore up washouts. County and municipal leaders who rode out the storm provided information to Koon, which led him to believe the storm was not catastrophic, yet. Utilities such as power and water were likely damaged in some areas of the Keys. Four “last resort” shelters set up on the islands will become more permanent, with services such as food and supply distribution. The military planes waiting to be brought in are filled with supplies from organizations such as the Red Cross and the Salvation Army. 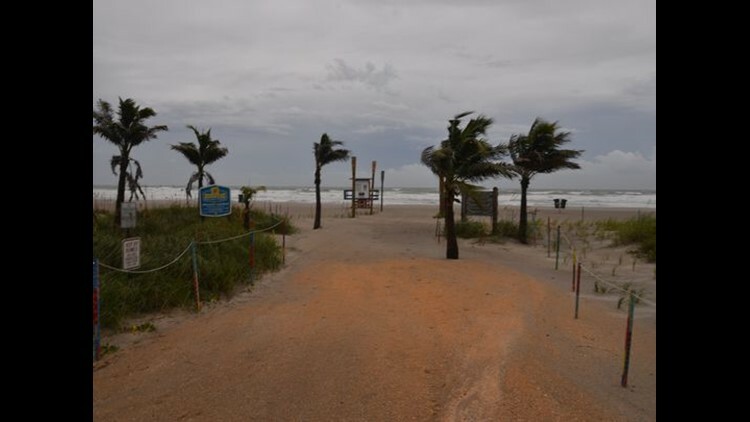 The storm also brought punishing winds to Marco Island, but there were no reports of major damage, Koon said, adding he had spoken with Marco Island Fire Chief Mike Murphy. Hurricane Irma weaved and wobbled for days, but by Sunday afternoon it became clear that Irma’s eye would steer clear of Tallahassee. Leon County imposed a countywide curfew from 9 p.m. until 7 a.m. Sunday, Monday and Tuesday nights. The National Hurricane Center said Irma will pass the Leon-Jefferson County border around 2 p.m. Monday afternoon and then head up into north central Alabama by Tuesday morning. Because of the shift in Irma’s path local residents are less likely to see flying debris and structural damage. Folks in the Tallahassee-Leon County area can expect strong tropical storm force winds of 40-60 mph with low-end gusts of 60-75 mph and an average of 5 inches of rain. Wind conditions are expected taper off by Monday evening, making it possible for utility crews to get out and begin repairing the damage. In Brevard County, on the state's Atlantic Coast, the National Weather Service plans to investigate whether there were three additional tornado touchdowns in addition to the confirmed tornado that destroyed six mobile homes Sunday near Turkey Creek in Palm Bay and another that touched down nearby. Early Monday, Miami-Dade Police announced via Twitter that 28 people had been arrested for burglary or looting. Sarkissian reports for the Tallahassee Democrat, Bacon for USA TODAY. Contributing: Jeffrey Schweers and William Hatfield, Tallahassee Democrat; Joseph Cranney, Naples (Fla.) Daily News; Dave Berman, Florida Today; Nicole Rodriguez, The Stuart (Fla.) News; Trevor Hughes, USA TODAY.